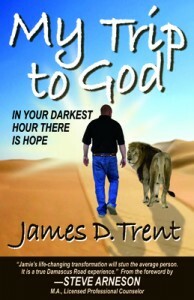 D. Trent, in a book titled My Trip to God (LifeBridge), shares his life-changing transformation at the age of 40. 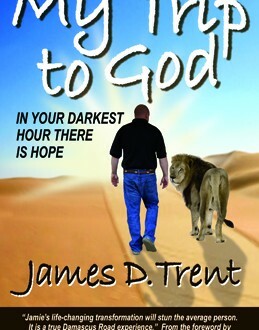 In this no-holds-barred account, the South Carolina businessman describes his self-centered, prideful life of alcohol, drugs, and infidelity, and how it was dramatically changed by God. The encouragement to write this account came from the many sessions he and his wife had with Steve Arneson, a licensed professional counselor in Columbia, South Carolina. Says Arneson, “In my many years of counseling, I have never encountered a story like Jamie’s. Not only did he become totally honest regarding his past, but the events surrounding his about-face were beyond anything I could imagine. James has spent over 20 years in the financial services industry. He and his wife, Kelli, have three daughters and are members of Mt. Horeb United Methodist Church in Lexington, South Carolina.